By James Bacon: The party scene is big part of Capricon. 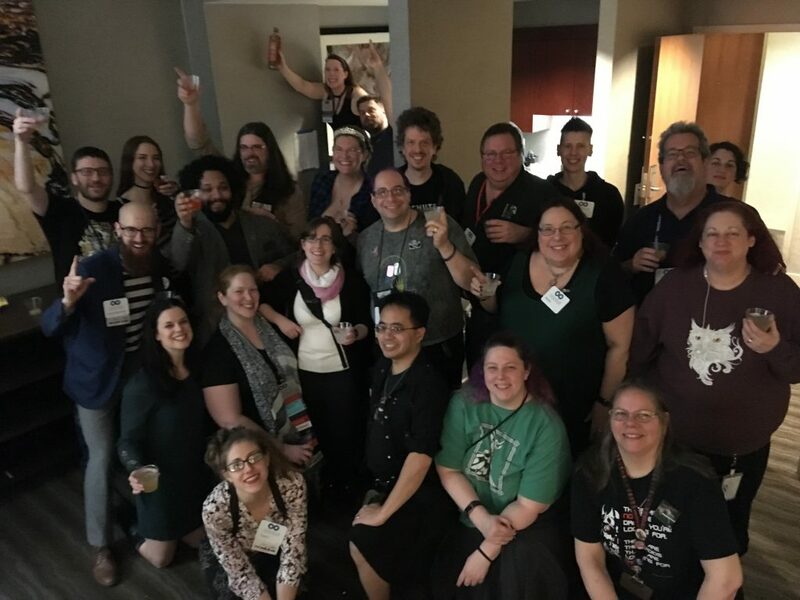 Although I first encountered parties at Worldcon in 1995, the idea of a 1,000-person con having two floors of suites with large rooms, some much bigger than places I have lived, all hosting parties was mind-blowing. Friendly and welcoming, going from room to room enjoying the hospitality and of course refreshments, I have yet to attend a convention where the party scene was better. 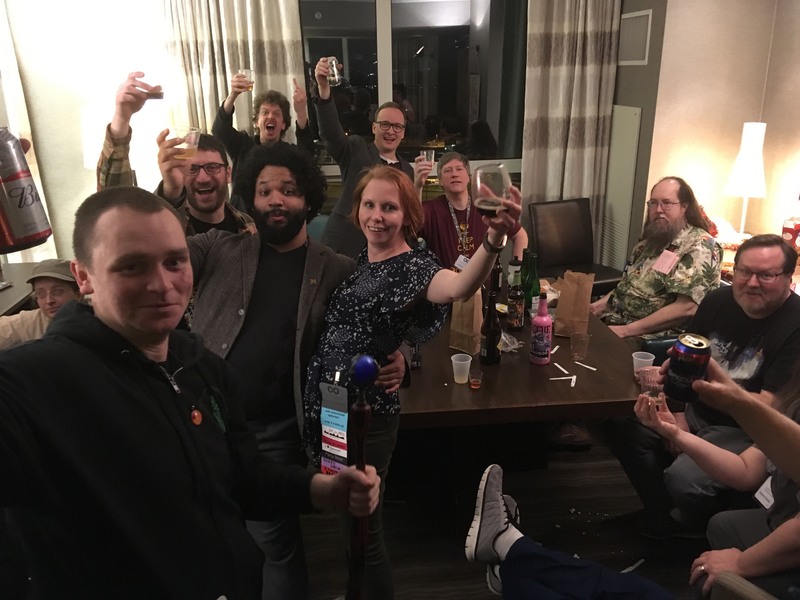 Although I have heard amazing things about Norwescon and have loved great parties at both Arisia and Boskone. Thursday night may be a quieter night, but it doesn’t feel quiet, and there are a number of parties taking place. I end up helping a couple of them prepare, moving furniture around and so on. Tammy Coxen is doing an amazing Tammy cocktail party with a series of drinks representing Worldcons and Worldcon bids. Dublin 2019 is well represented here with a fresh take on the traditional whiskey and red lemonade. Tammy is serving the Whiskey with lemon juice, grenadine and club soda. I have managed to bring some red lemonade from Europe, this uniquely Irish soft drink goes very well with Whiskey, so fans enjoy it, and we have some regular whiskeys, Bushmills, Red Bush, Powers to taste it with. I tell everyone it is the most popular way to have whiskey in Ireland, although I admit I read that online, but Red Lemonade is always available in Irish Pubs and in Dublin a Jammie and Red is very common drink. The range of regular whiskey is bolstered with the locally bought ‘Clontarf’ whiskey which I call ‘Clondalkin’ whiskey, which while very affordable at $18 a litre and possibly frowned upon by the connoisseur, is quite smooth with a stronger bourbon or caramel hint from it. It is great with the Red Lemonade. DC in 2021 has a vermouth-based drink on Tammy’s menu, but Bill Lawhorn, Co-Chair of the bid, like myself deviates from the menu and produces a ‘DC Neapolitan,’ consisting of Baileys, chocolate liqueur and tequila rosa, incredibly tasty sweet creamy alcoholic shots that go down well. Although unrepresented on the menu due to no bid, I have a Down East Cider from Boston. Dave, Helen, and an Irish hand. Helen Montgomery and Dave McCarthy are throwing a party for the Chicago 2022 bid. They have some great food, a creamy meatball thing, and a space theme to their drinks. ‘Take it to the Stars’ is their tag line, and I am offered a vodka and orange tang cocktail mix. I soon learn that the orange drink is the stuff of astronauts, and it goes down easy along with that other well know space drink, Earl Grey tea with scotch and honey. 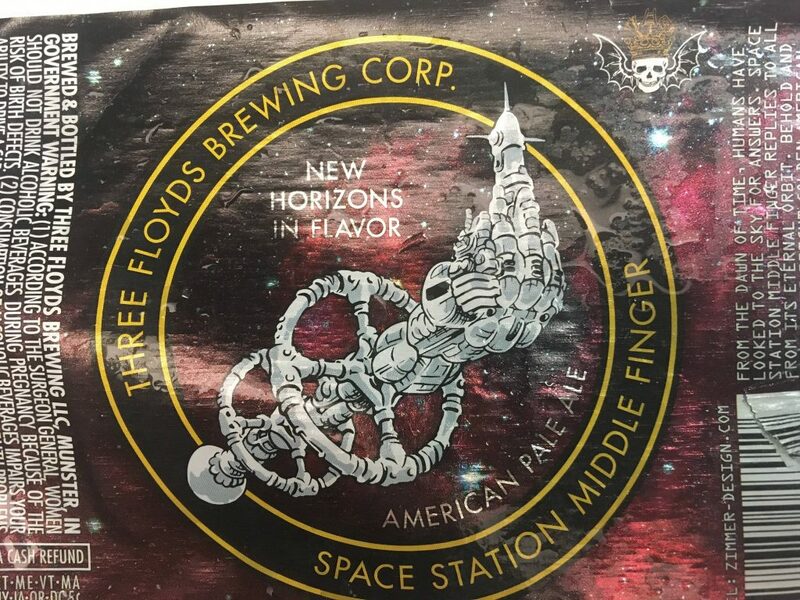 Also a few cases of Space Station Middle Finger, an American pale ale, from the Three Flyodds Brewing Company. The space theme is really nice, and there is a lot of buzz here for 2022. I head to Rook Books, where Deanna Sjolander and Blake Hausladen are hosting an excellent Books and Beer party, where there is a wide variety of very interesting drinks. I go to the Rock Band party, and engine room parties, and eventually have a short snooze on a couch at around 2 a.m. in Tammys. It has slightly caught up with me, but it is a good night, and I eventually get to the bed by 4 a.m. after causing some consternation by drinking Balvenie 12-year-old single malt scotch, with red lemonade. Friday and Saturday will have a range of other parties. 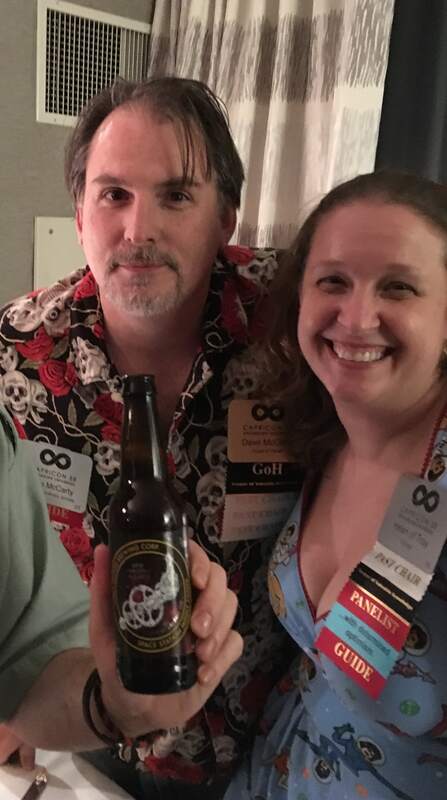 Barfleet are having a UBS Abandon 10-year celebration, there will be a ‘For the Love of Comics’ party, Minneapolis in 2073, more Books and Beer and a list of others, all to look forward to. Panels start at 10 a.m. for me, so time for sleep. This entry was posted in Conventions and tagged Capricon, James Bacon, Tammy Coxen, Worldcon bids by Mike Glyer. Bookmark the permalink. Is it possible that James will have too much fun? Watch our next exciting episode, same Bat Time, same Bat Channel! 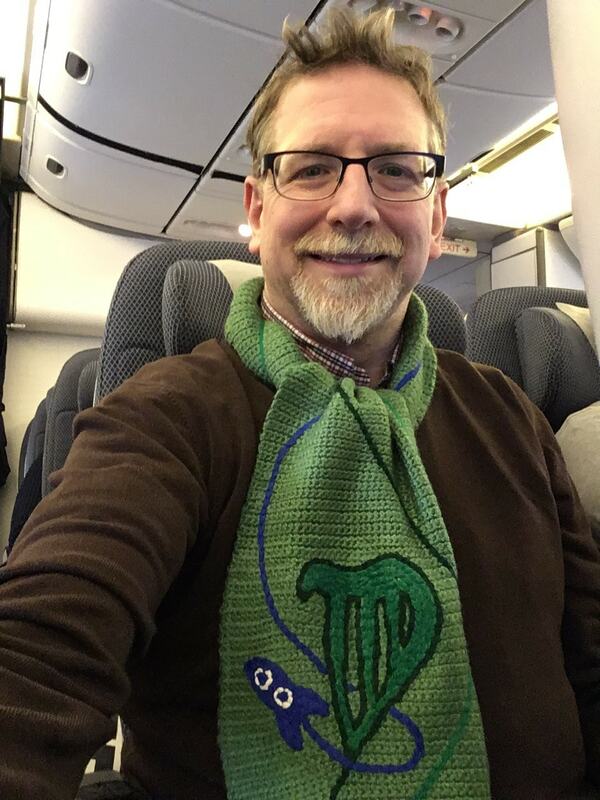 I just wanted to say that I love that scarf. Also glad to hear that James Bacon is having fun. It’s a lovely scarf. I want to know who made it.